When you need a crawler loader to take on heavy materials on your site, you know you can turn to John Deere for all your needs. With this in mind, Deere has introduced the 655K and 755K Final Tier 4 crawler loaders to assist operators with the hardest tasks on the job. Let’s take a look at some of the features of these crawler loaders, what they share in common, and what makes helps each stand out. Both the 655K and 755K have a certified Final Tier 4 John Deere PVS 6.8-liter engine. This engine has a four-valve cylinder head which provides excellent airflow, resulting in greater low-speed torque and enhanced transient response time by utilizing a cross-flow design. It also has multiple rated speeds to reduce noise and improve overall fuel economy. Both crawler loaders are also equipped with Eco Mode, which optimizes fuel economy while maintaining ground speed by automatically adjusting engine speed and transmission based on the load. When working with a heavy load, the engine speed increases as necessary to ensure that there is enough power to push through.. With the ability to work in both forward and reverse directions, Eco Mode improves overall fuel economy. Both the 655K and 755K offer a large amount of net power to help operators on the job. The net power of the 655K is 155 horsepower, while the net power of the 755k is 194 horsepower. These amounts are designed to reduce downtime and improve efficiency for customers. The 655K and 755K have hydrostatic transmissions, which give users infinite speed control, power management, live power turns, and counter-rotation right from the cab. Operators can execute all of this while staying in gear and utilizing dynamic braking. The hydrostatic transmission control options give operators the option to choose between several transmission control settings – speed in grip and a v-pattern control with foot pedal steering. 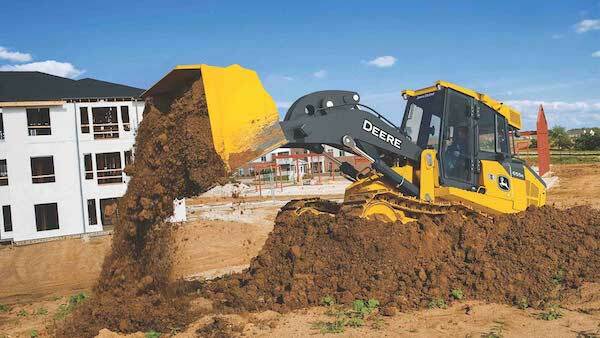 If you have any questions about the 655K or 755K crawler loaders, you can contact your local John Deere dealer.